mommyplayswithart | My parents are art teachers…this is just what I do. My parents are art teachers…this is just what I do. I have seen many DIY kitchen projects on Pinterest and really wanted to make one for my daughter. But, after all the things I wanted to do to it, the cost was not worth it considering what you can get a used kitchen for on craigslist. So, that is what I did. I bought this used kitchen for about $80. (picture below) It was in mint condition and the seller threw in a whole bunch of food, pots, cash register, dress up clothes….when I explained my project she just kept putting stuff in my car 🙂 I didn’t like the color, and wanted it to be more gender neutral and realistic. Backsplash – I painted it white and then used hot glue to attach clear deco stones from the dollar store. Filled in with modpodge for extra hold. Added a stick on light above. Mircrowave – buttons from dollar store calculator. Dishes/Food – check local thrift store. I found small plastic dishes that are more realistic and actually hold the play food. I also found decorative food there!!! I added a couple shelves in the fridge for more storage. Also, I used a spice rack from home depot as a “pantry” on the side. This entry was posted in Uncategorized and tagged play kitchen, play kitchen remodel, play kitchen upcyle on October 30, 2012 by janeekobe. Memory foam – Target has memory foam mattress covers on clearance because they are the dorm room size. I cut two beds out after measuring the crates (doubled over). Waterproof Cover – old waterproof table covers left from the holidays. Cut and sew the edges around the memory foam, just like a pillow. Soft/washable cover – I got old fleece blankets for $3 at Goodwill. Cut out to fit made pillow. Leave one end open and cut strips to tie. So far this is working great. When we have an accident or they are just smelly I just untie the strips and throw the cover in the wash. You can also wipe off the waterproof cover. 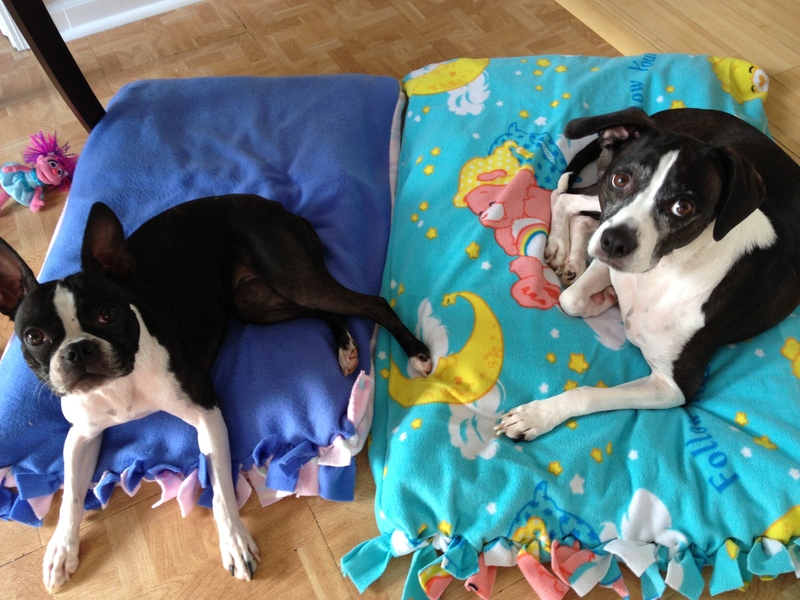 This entry was posted in Uncategorized and tagged DIY Dog bed, DIY Memory Foam Dog Bed, Dog Bed, Dog Beds, Easy Cheap Dog Crate Beds, Memory Foam Dog on October 30, 2012 by janeekobe. Here are the finished costumes. Headband, Fur and suede fabric – Sew ears (just two ear shapes together and turned) and hand sew/glue to headband. Drape fabric over head and cut holes where ears will poke through. Carefully cut out face hole (start small, can always widen the hole) I just brushed glue on the edges to stop fraying. Old Navy brown performance fleece – They have Tall sized which is great for my 6’4″ ewok husband. This entry was posted in Uncategorized and tagged adult ewok, child ewok, ewok, ewok costumes on October 30, 2012 by janeekobe. 1. Purchase/gather fabric, yarn, feathers, model magic. I used a sewing machine for the pouch but you could hand sew that. 2. drape the fabric over at the desired angle and cut holes for the ears. Pull through and then cut out the face bit by bit so it lays right. Sew in place. 4. Embellish with yarn and feathers. I made little bone/tooth beads with model magic. 5. Paint on ewok finger nails. * I removed the tail (shown in pic) with a seam ripper. I also bought brown fleece pants to complete the outfit. 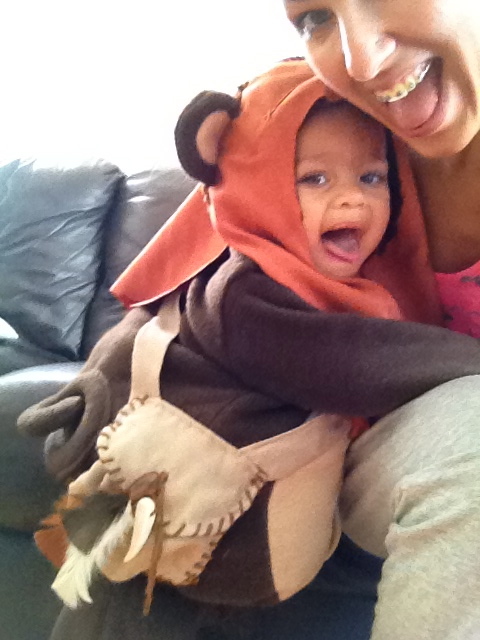 This entry was posted in Uncategorized and tagged costume, ewok, kid, kids, w on September 26, 2012 by janeekobe.